I hope you will enjoy this article from the 1927 May-June issue of the Field Artillery Journal about another military equine hero – Rodney. FROM: C. O. Battery “D,” 3rd Field Artillery. 1. 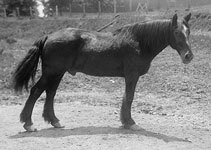 In August, 1910, while the Battery was absent in the field there was left behind at Fort Myer an old horse, name, “Rodney,” who had faithfully done his work in the organization for many years, and who through age and other infirmities was unable to further pull his bit. Through ignorance of a man left behind in charge of quarters he showed the horse to an Inspector, who came to the post, and as a result the horse was inspected, condemned and ordered sold. The men of the battery heard of the matter just in time to have a representative present at the sale and bid the horse in, as they could not bear to see the old fellow sold outside the service. He brought something like $120, which was subscribed and paid by the men of the organization. 2. Since that time this horse has remained a pet and an inspiration to the men of the battery and a favorite among officers, and has been fed, groomed and cared for by the battery. He is reputed to be thirty years old. His D/L was probably sent in to the Q.M.G.O., when he was sold, as it cannot be located. 3. This horse is an inspiration and though unable to accompany the battery in the field, should be cared for at the post, as has been done in the case of other “retired” animals (old “Putnam” and old “Foxhall,” both of the 3rd Field Artillery). 4. It is requested that authority be granted to stable, forage and care for this animal wherever he may be for the balance of his life. CAPT. CHAS. G. MORTIMER, 3rd F. A. This letter with its nineteen subsequent indorsements caused the issuance of orders necessary to insure proper care and forage for this horse during the remainder of his life. The following history was prepared in 1916 from all information obtainable at that time. The horse known as “Rodney” was transferred to Light Battery A, 2nd Artillery, on November 2, 1896, at Fort Riley, Kansas, from Light Battery E, 1st Artillery, with the rest of the horses of the latter battery. His previous history is not known. At that time, he was about eight years old, 15.3 hands high, and his weight was about 1250 pounds. His color was dark bay with black points, and he was an unusually handsome animal. In breeding, he was an excellent type of the graded thoroughbred of probably the second generation. He had the fine features, the courage, activity and endurance of the thoroughbred, and the size, conformation, power and serene disposition of draft stock. The long fetlocks and the thick coat of hair in winter, together with the characteristic conformation of the Clydesdale, left little doubt that he came from this strain. He soon attracted attention in Battery A by his intelligence, his power, and his willingness. At rapid drills or when the draft was difficult, his broken harness was an evidence of his superior efforts. During the succeeding fourteen years, till the day of his sale, he was literally a “wheel horse.” He was never sick, and he was never known to refuse a feed or a task. He was petted by the men who looked after him with genuine affection and with a confidence that was born of experience in many difficult situations. When Light Battery A went to Cuba as “Grimes’ Battery,” with the 5th Army Corps in 1898, it was at once ordered to El Poso. The road had been churned into deep mud and was well-nigh impassable for the heavy artillery carriages. To meet this situation, Captain Grimes took his two most powerful horses, which were “Rodney” and his mate, “Shaw,” and pulled the carriages out of the mud holes and ditches whenever they became stalled. It was a remarkable and an exhausting service, but it was rendered with a fidelity that secured the prompt passage of the battery to its position for action. The significance of this performance not only to the battery, but to other troops, was far-reaching in stress of events then taking place. When the battery changed position, it marched in rear of Battery K, 1st Artillery. One of the carriages of the leading battery became bogged, so that the column could not proceed. Captain Grimes sent for “Rodney” and “Shaw.” When they arrived, the driver, seeing the exhausted condition of the stalled team, had these horses unhitched, and with his single pair, drew the carriage from its unfortunate position. It was no doubt distasteful to Battery K, to have their carriage rescued by horses from another battery, but they soon realized that such animals as “Rodney” and his mate were rarely found, and their resentment soon gave place to a generous admiration. Thus, all during the trying days before Santiago, “Rodney” served his country by putting guns where they were wanted, in the face of great obstacles, and he earned a place in the nation’s gratitude no less than the men who served the guns after they were in position. Without his service, the story of Grimes’ battery might easily have been shadowed by delays that would have deprived the Army of its fire when needed. After the Santiago Campaign, “Rodney” again served with his battery in Cuba from January, 1899, to April, 1902. In 1903, he accompanied the battery on a march of 700 miles from Chickamauga Park, Georgia, to Fort Myer, Virginia. Throughout this long, continuous march, averaging 21 miles a day, he did not lose a day from his place in the “wheel,” and he reached Fort Myer in as good condition as when he started. In the succeeding years, he marched thousands of miles and participated in maneuvers in various parts of the country. He outlasted all of his fellows. Few animals have rendered as much service and many came and went while he was still doing duty. Thus, for the investment in his purchase and maintenance, he proved an unusual economy for the government. The battery became successively, the 3rd Battery, Field Artillery, and Battery D,* 3rd Field Artillery, and the equipment experienced radical differences in model. In all changes of name, matériel and personnel, “Rodney” stood out as one of the elements that foster pride of arm and about which the affections of soldiers cling. At length it became evident that the long marches and the strain of heavy draft were too great a tax on his willing but waning strength. Age and years of faithful service had brought declining vitality and a merciful consideration made his relief a necessity. There was never any thought, however, that he should go to a huckster’s cart or spend his last days in a dray or a dump wagon, with scant food and perhaps brutal treatment. Human nature will assert itself and with soldiers, the human element must be reckoned with. When he was condemned and sold, the men in the battery contributed from their small pay the price of $107, to which a zealous dealer forced them, and bought him for the battery. No contribution was ever made more generously, and the spirit which they manifested was a tribute, not only to their old friend, but to the loyalty that made them one of our most efficient fighting units. Men who will not forsake a faithful horse may be depended upon to defend their flag and to maintain the best traditions of a battery whose history is rich in the service of its country. For a long time, he was given the task of hoisting the grain and hay into the forage loft and so well did he know his duties, that he required no control but the voice. During the years since his retirement, he has subsisted largely on grazing, so that the value of the food consumed has been small. He has richly deserved whatever of kindness and gratitude his masters may show, and the formal recognition of his retirement and maintenance during the few remaining years of his life would not only be appropriate, but it would show to the world that our government is great enough to recognize and reward true merit wherever it is found. * Battery D, 3rd Field Artillery, referred to above, later became Battery A, 16th Field Artillery. “Rodney” died at Fort Myer, Va., at an age of about 30 years.